Like that’s not enough, I’ve got this demon banshee of a headache. Yes, that is chocolate milk and no, I am not five years old. If you ever have the chance to avail yourself of Ronnybrook Farms chocolate milk, you should grab that opportunity. AND I have heartburn. Which I just typed as heartworm, which, thankfully, I do not have. there’s nothing wrong with this meal. it looks fantastic, with our without a stomach ache. When I was in law school, one of my classmates made fun of my peanut butter sandwich. That person failed the bar. I did not. That is all. Mmmmmmmmmmm. 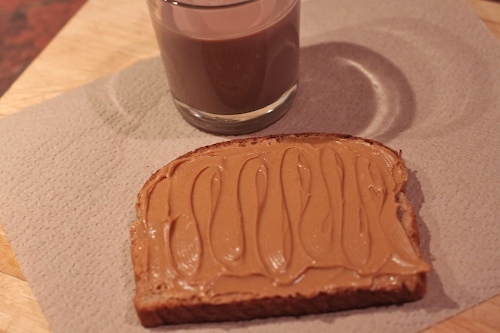 P-butter and choccy milk. Looks like the perfect meal to me! That is a very artistic peanut butter sandwich. Mine is creamy tomato soup and a grilled cheese. Those are some spectacular peanut swirl marks. Feel better. I hate headaches. I could honestly live a full and happy life without ever having another headache, but if I do, I think I’ll try peanut butter and chocolate milk. I had a peanut butter sandwich for dinner myself. As I didn’t have tummy trouble but am still unwinding from work, I also had a big, frosty glass of vodka. Your sandwich looked better than mine. Maybe I should have made the sandwich before drinking the vodka. I detest chocolate milk, but I would happily try the Ronnybrook version, because they rule. hi all, i appreciate all the comments on a lowly peanut butter sandwich. i made the peanut butter extra swirly just for you.